May 22 happens to be the birth anniversary of one of the greatest wordsmiths of our times – Sir Arthur Conan Doyle. 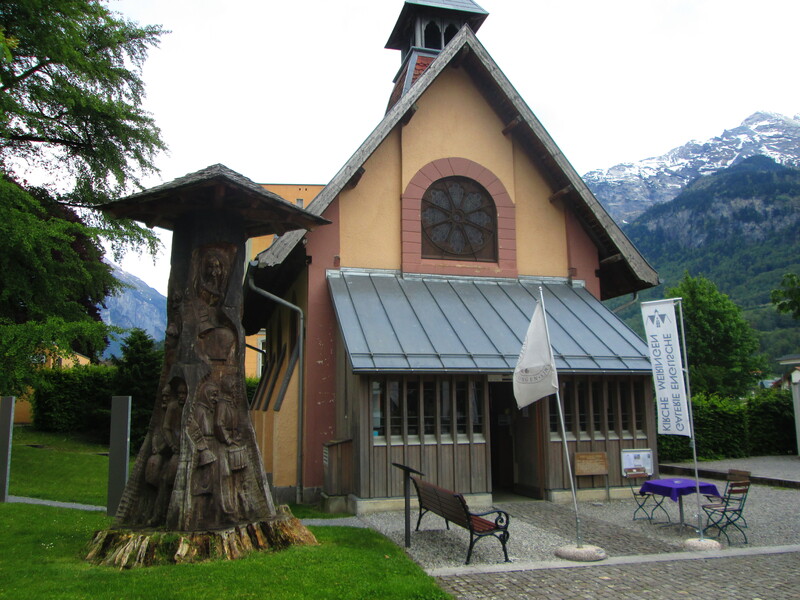 This year, the family decided to celebrate it by paying a visit to a museum dedicated to him in Switzerland. 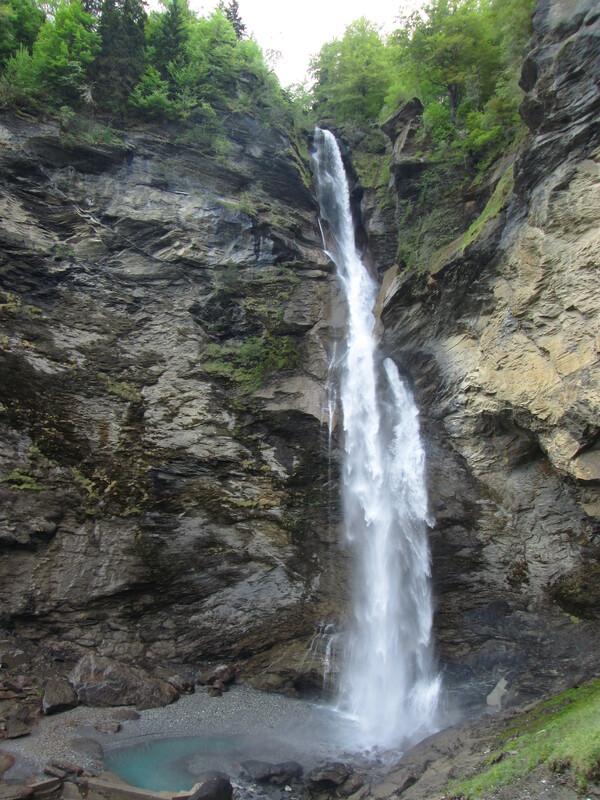 Included in the itinerary was a visit to the famous Reichenbach falls. That is where Sherlock Holmes was supposed to have met his end while fighting the criminal mastermind Professor James Moriarty. “The Final Problem”, a short story set in 1891, suggested the death of the greatest detective whose methods have influenced crime investigations all over the world! 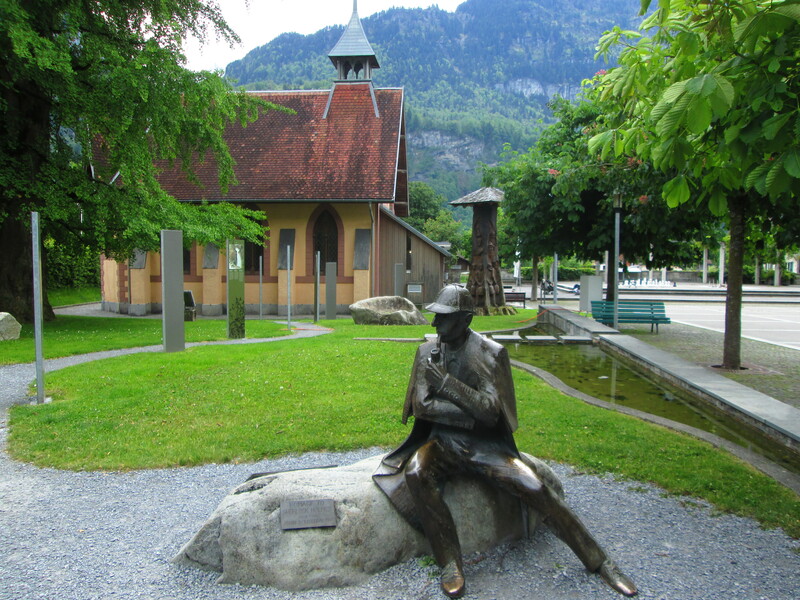 The small museum dedicated to Sherlock Holmes is located in a quaint little church in the small town of Meiringen. The entrance has a fine sculpture of the detective in deep thought. A short pathway of gravel leads one to an old building which was originally used as a church. The pathway has stone panels on its sides. These contain beautiful illustrations depicting in brief not only the story of “The Final Problem” but also retirement plans of the detective! 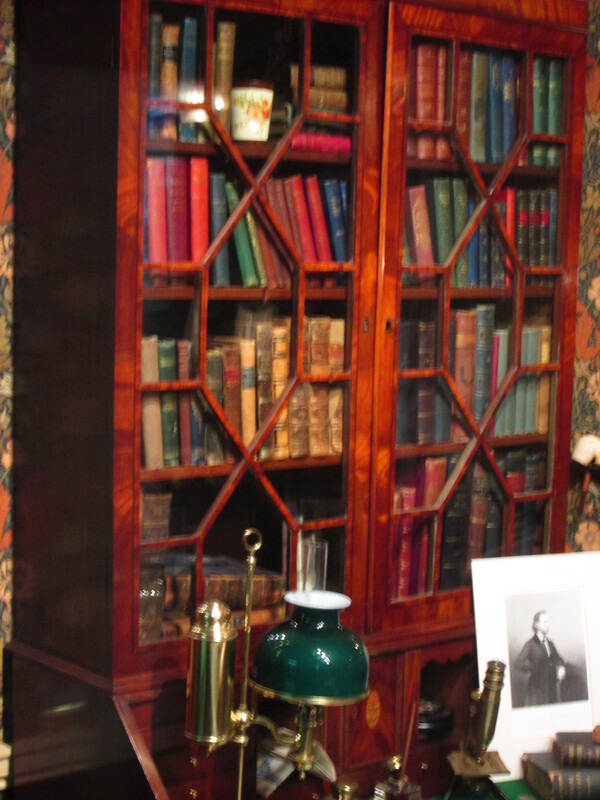 The basement has several displays which would interest anyone familiar with the life and times of Sir Arthur Conan Doyle and his legendary characters Sherlock Holmes and Dr. Watson. 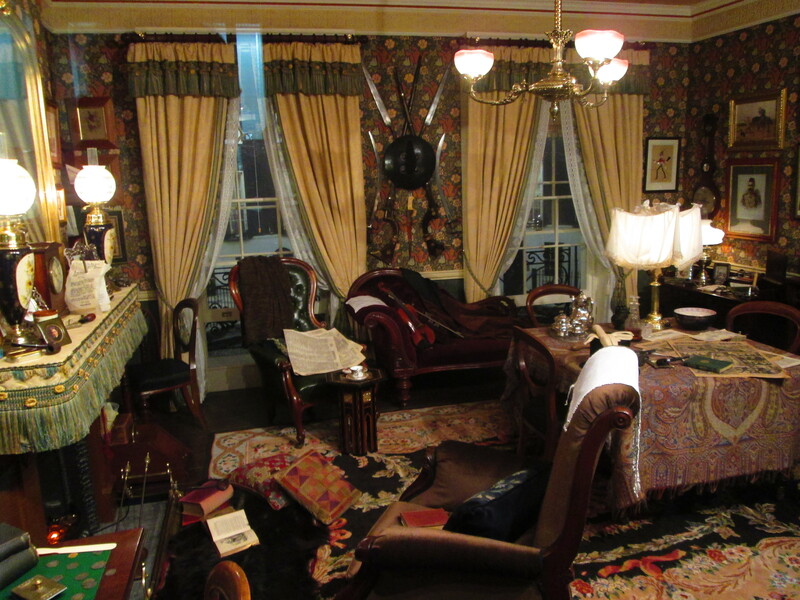 The highlight is a faithful recreation of the room at 221-b, Baker Street, just after the two inhabitants have left it hurriedly, supposedly on a top-secret mission of theirs. In a corner of the room one can spot a cupboard which is full of the kind of books and records the destruction of which would regale many a criminal hounded by the legendary duo in their times. For the architecturally inclined, there is a map showing the location of 221-b, Baker Street, as also an elevation of the building which houses it. 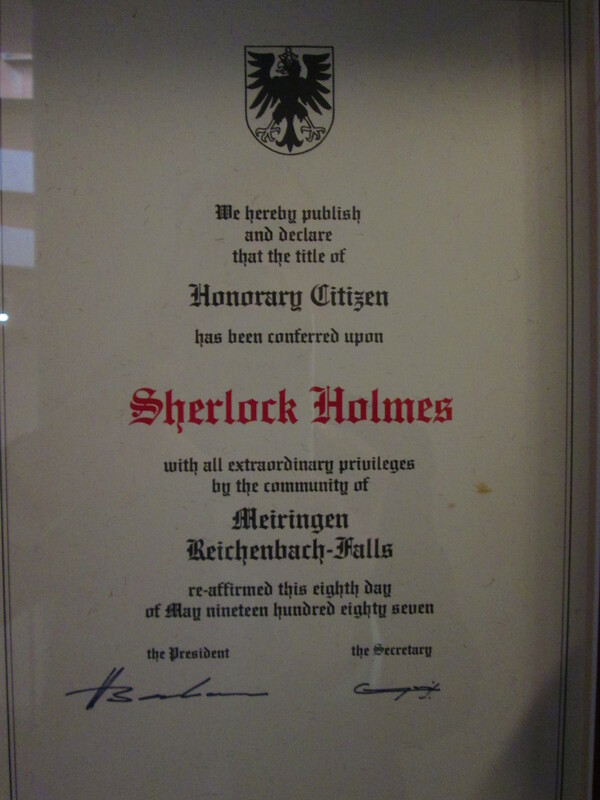 The display has, amongst others, sculptures of Holmes, the certificate of honorary citizenship of Meiringen issued to him, a set of binoculars, the famous pipe and the hat. The small note left behind by Holmes at the Reichenbach Falls can also be seen. Uniform of a Scotland Yard rozzer of 1890s is on display, along with some investigative tools used way back then. Articles touching upon the rugby interests and army career of Dr. Watson also enthrall the visitor. 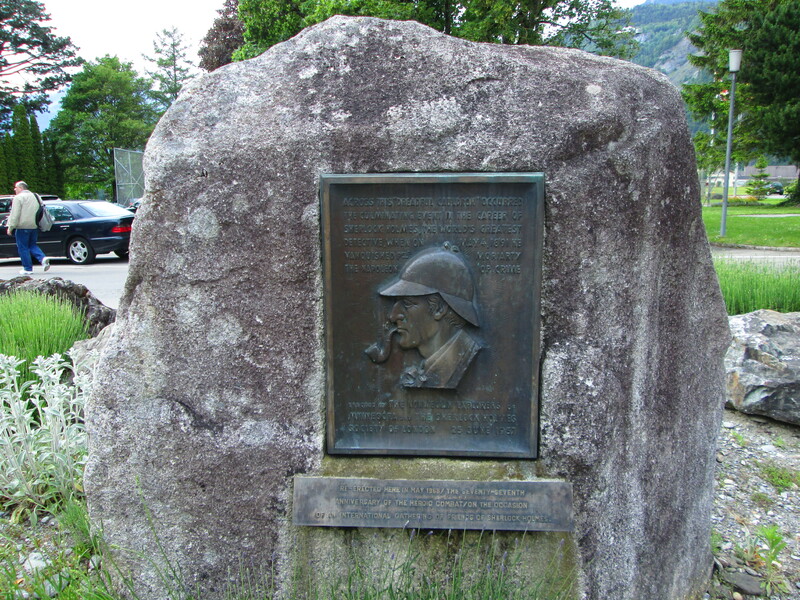 “The Final Problem” tells us that in May 1891, Sherlock Holmes and Dr. Watson had stayed at the Englischer Hof at Meiringen. A walk had led them to the Falls, from where Dr. Watson had been tricked into returning to the inn, leaving Holmes all by himself. Finally, Dr. Watson returns to Reichenbach Falls, only to find two sets of footprints going out onto the muddy dead-end path with none returning. There is also the note from Holmes, explaining that he is about to fight Moriarty, who has graciously given him enough time to pen this last letter. Watson sees that towards the end of the path there are signs that a violent struggle has taken place and there are no returning footprints. It is all too clear Holmes and Moriarty have both fallen to their deaths down the gorge while locked in mortal combat. Heartbroken, Dr. Watson returns to England. In the present, a funicular railway takes the visitor up to a platform from where the falls are clearly visible. The place from where Holmes and his adversary had fallen off is marked with a star. 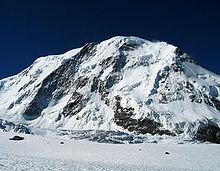 One can trek up to the star and also beyond and enjoy the magnificent scenery around. While climbing the mountain, one contemplates on the ingenuity of the human mind. When used against humanity, it has the potential to give rise to a Napoleon of criminals like Dr. Moriarty. When deployed to protect the denizens against fraud, crime and cheating, it produces characters like Sherlock Holmes and Dr. Watson. In a way, Dr. Moriarty still lives on even today. He manifests himself in various forms. Criminal deeds, injustice, disparity in opportunities and incomes and corruption, just to name a few. However, one can derive satisfaction from the fact that characters like Holmes and Watson also continue to live on amongst us, represented by forces opposed to the likes of Dr. Moriarty. The myth of Sherlock Holmes lives on. 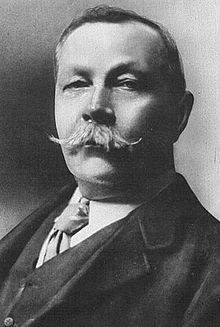 One marvels at the mental capabilities of a person like Sir Arthur Conan Doyle who created a detective who is more real to most of us than any real person we might have ever met. Such visits are more like pilgrimages. These are but a form of tribute to legendary authors who live on in our collective psyche and imagination through their works. Here is a lovely piece on the places and locations where many of our favourite characters have operated from. Literature buffs would find this well researched and articulated. Great characters in literature get all the credit, but the fictional spaces they occupy are often just as interesting and can provide an opportunity for the reader to go even deeper into a story. What would some of your favorite stories be without the creepy old farmhouses, crumbling castles, and estates overlooking a body of water whose waves crash against the rocks at night? Today, as we celebrate the birthday of Daphne du Maurier — a writer who gave us one of the 20th century’s most unforgettable grand old homes, in Rebecca — we’re rounding up the most memorable structures that served as settings for some of our favorite stories. Having settled back in the shadow of the Alps yet again, I am filled with a sense of exhilaration and awe. The heat of India has got replaced by the chill of melting snow. The dust has given way to fresh air which is invigorating. In the cobbled streets, litter is missing. The greenery and the snow-capped mountains are a relief for the eyes. The ears are just about getting used to the soothing silence which has replaced the relentless honking on Indian roads. Courtesy in public spaces is once again leaving me dumbstruck. But the stark contrasts do not end at the physical level. There are differences in the mental make up. The value systems which govern our behavior appear to be differently configured. The forces of nature and nurture which have shaped our personalities are quite different. East and West can both learn quite a few things from each other. In the West, we find better respect for the public good. For instance, public spaces are cleaner and drivers on roads are courteous. On the contrary, in India, we keep our houses clean and water our gardens everyday – but, when we go to the beach front, we litter the place with gay abandon. In an office setting, a friendly colleague could get chastised for being careless on a project. In India, a criticism would either not be made – so it may not hurt the feelings of a friend – or taken personally by the recipient. Corruption is another manifestation of the same lack of concern for the common good. Society is relatively corruption free in the West. 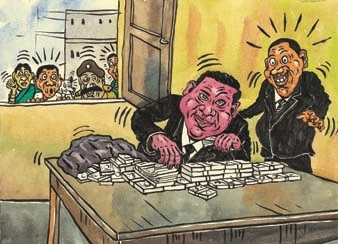 In India, corruption, tax evasion, cheating and bribery have become a part of daily routine. Apathy towards solving problems which affect the ordinary citizen is another dimension. In the West, people form groups to solve common problems in a proactive manner. In India, we see serious problems around us but do not try to solve them. We either believe that the problems do not impact us directly, or it is for someone else to resolve the issues. If we have to progress, we have to change this attitude, listen to people who have performed better than us, learn from them and perform better than them. In India, we appear to have perfected the art of rationalizing our failures and explaining them off by misquoting our scriptures. We are good at finding excuses to justify our incompetence, corruption, and apathy. This attitude will not do. Another interesting attribute that we Indians need to learn from the West is that of accountability. Irrespective of your position, in the West, you are held accountable for what you do. However, in India, the more ‘important’ you are, the less answerable you are. Organizations whose top honchos indulge in illicit relations with their team members need to be pulled up and acted against as firmly as a junior cashier who siphons off money from the till. Dignity of labor is an integral part of the Western value system. In the West, each person is proud about his or her labor that raises honest sweat. On the other hand, in India, we have a mindset that respects only supposedly intellectual work. A peon deserves as much respect as a Head of the Department. CEOs whose fragile egos are shaken by someone else parking his/her car in the normal slot needs to do some introspection. Indians tend to become intimate even without being friendly. They ask favors of strangers without any hesitation. Rudyard Kipling once said: A westerner can be friendly without being intimate while an easterner tends to be intimate without being friendly. Those who have worked as expatriates in another cultural setting would readily attest to this. In India, more than 70% of the time of senior managers is spent on follow-ups; just ensuring that what is committed is indeed delivered. Delays are easily explained, and so are cost over-runs. Keeping a person unduly waiting is a sure sign of seniority in an Indian organization. Here is yet another lesson to be learnt from the West – that of professionalism in dealings. 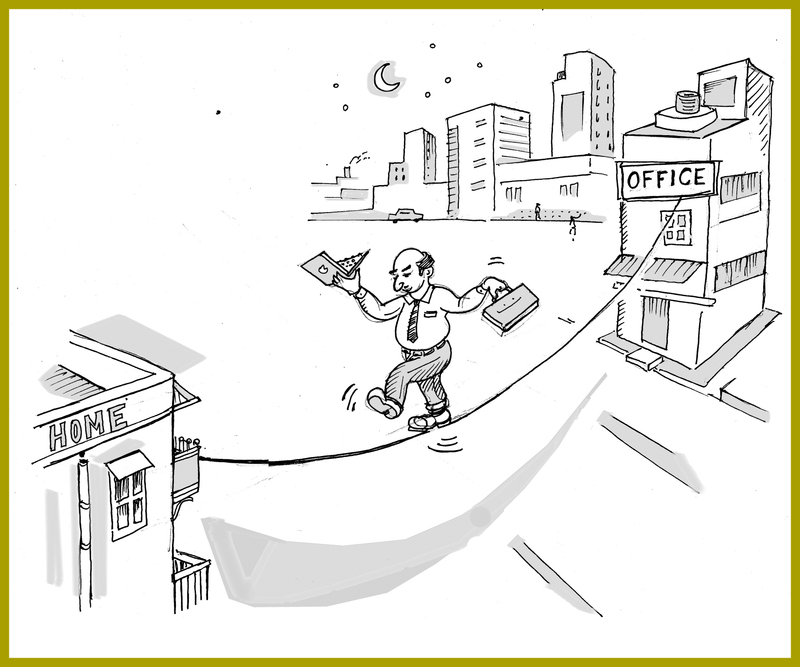 Managements in the West ensure better work-life balance for their employees. Indians are part of a culture which has deep-rooted family values. We have tremendous loyalty to the family. For instance, parents make enormous sacrifices for their children. They support them until they can stand on their own feet. On the other side, children consider it their duty to take care of aged parents. In organizations, we often find executives who are competent as well as extremely loyal. Also, respect for seniors is deeply ingrained in the system. There are times when juniors find it tough to take independent decisions. Very few are adept at registering a dissent with their seniors. Successful organizations have a culture which is designed to overcome such handicaps. One of the key strengths of Indian values is the presence of so much love and affection in the family life. In India, families act as a critical support mechanism for employees. Thus, resilience is better. In the West, it is common to have break-ups when the career prospects of a manager nosedive. This adds to the stress experienced by a manager. Mental disorders present a much greater challenge. 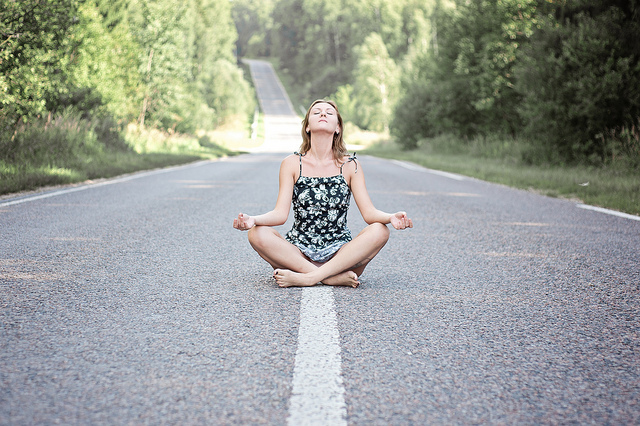 Predominantly, life has a materialistic approach, leading to a vacuum within. Indians have improved upon the art of managing chaos and disorder. Even in high entropy situations, Indians tend to keep their nerve. Perhaps, this leads to better levels of perseverance as well. Successful management of a human congregation like the Kumbh Mela is but one example of this trait. Upbringing steeped in religion and spirituality enables an average Indian to face adversity and failures with equanimity. Values are like mountains. They have survived for centuries and shall continue to do so much after we have kicked the bucket. Universal common denominator is that of, say, love and affection. Over and above that, value systems differ across continents and cultures. When it comes to values, every culture has its own Unique Selling Proposition. In this age of globalization and connectivity, mingling of diverse cultures is bound to happen. Learning from other value systems and adapting their good features is the only way to enable humanity to realize its full potential faster and better. Here is an interesting post which cites words of wisdom from some of our famous authors. Writing isn’t easy. In fact, it can be painfully difficult. Why? Because it’s thinking, but on paper. 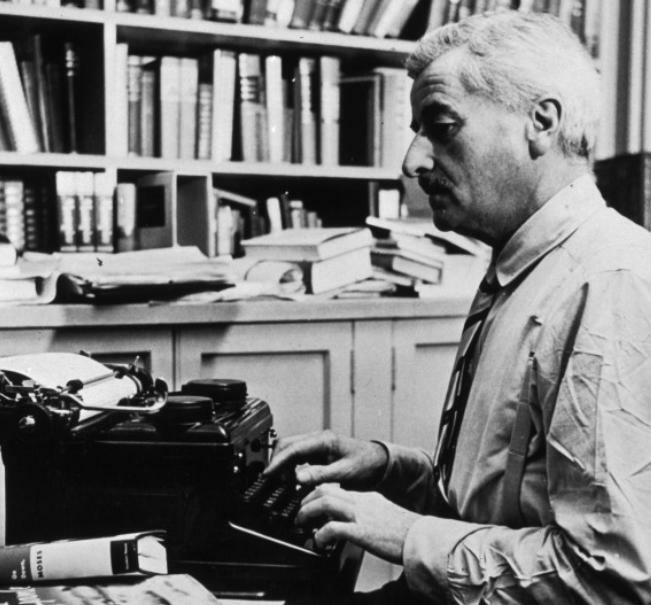 “To write well is to think clearly. That’s why it’s so hard,” said Pulitzer Prize-winning journalist and author David McCullough. Many great writers, including Joan Didion and Don DeLillo, have said that their purpose for putting words on paper is to find clarity with their thoughts, and have described the process of writing as one of becoming familiar with their own minds. 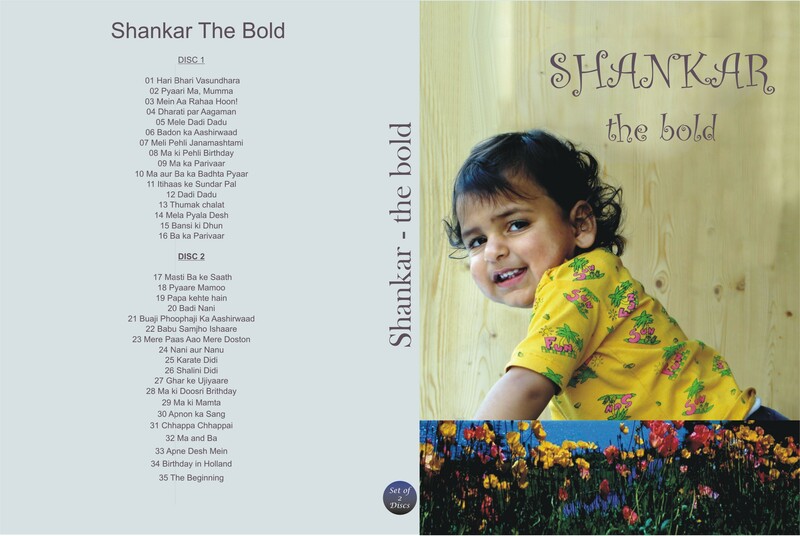 The latest family movie soon to hit a restricted number of screens is “Shankar-the bold”. It captures the life and times of the youngest one in our family, right from his birth till the time he celebrates his second birthday. As always, the process remains the same. Going through family pictures and videos. Selecting the ones which are worth preserving. Conceptualizing the overall script. Deciding on various sections. Putting them in a tentative sequence. Screening the photos once again. Rearranging some of these into newer sections. Putting these through an Adobe Photoshop wringer. Selecting the music to be used in the background. Consulting friends and family members for the choice of music. Seeking the help of others to download relevant songs. For some favourite songs, creating a special sequence of the visuals, in sync with the lyrics. Rearranging the script, if necessary. For the period to be covered, ensuring that all important events and people are getting covered. Retrieving poems, notes and letters specifically composed for some of these events. Planning to use these at appropriate places in the narrative. Using instrumental music as a backdrop so it does not distract from the verbal content on the screen. The younger generation needs to understand the background of the family. It also needs to know who all comprise the extended family. Members are spread over all the continents. To collect their photos, getting their names and relationships right and inserting them in the narrative is no mean task. Elders in the family are immensely useful in providing the finer details of the lives and times of our ancestors. A whiff of nostalgia, laced with family history, ensures that the movie does not remain an exercise in narcissism. Instead, it ends up being a valuable addition to the family archives. There are several movie-making softwares available. The one that we have liked is Womble Multimedia. Arranging the photos section-wise and inserting relevant audio tracks is a skill which one learns over a period of time. Once the movie has been composed, the question of its disc reproduction comes up. Each set has to be individually checked for its correctness. Defects in sound track or composition have to be ironed out. Eventually, a Master Disc takes shape. This is again played out on a dvd player, just to check that the aspect ratio and other details are well taken care of. Making each family movie unique is one of the serious challenges. For the latest offering, we came up with the idea of linking family events to important events. So, if the boy was born at a time when an important merger and acquisition had taken place in the business world, the event found a mention in the narrative. Since ours is a family of movie buffs, we decided to link important family events to movies released around that time. Let us say a marriage in the family took place in a year in which a blockbuster had hit the silver screen. So, a short clip from the movie found a place in the narrative. An exhausting but uplifting process. The unalloyed joy of creativity. The satisfaction of having made something which entertains, educates and celebrates a milestone for the family. Something which the younger ones would cherish when they grow up. A fragment of the subtle connection between the past and the future. The freedom, the intimate friends, we are surely going to miss. Filling up the colors of skills and knowledge in the blank recesses of our minds. Journeying through gushing mountain streams of joy or sand dunes of strife. Handling challenges that come our way, with all our grit, tact, charm and might. Spiced with a dash of arguments, tiffs and then quick patch-ups on the run. Extra hot spicy food is her favorite, she is full of vim and chutzpah. Hanging out with buddies in malls and lounges, life for her is on the roll. Under a star sprangled sky, the valley of memories like an array of well-lit tents. Some we may laugh off, wondering why we were childlike, reacting the way we did. Going in different ways, our special bonds we shall never be able to forget. 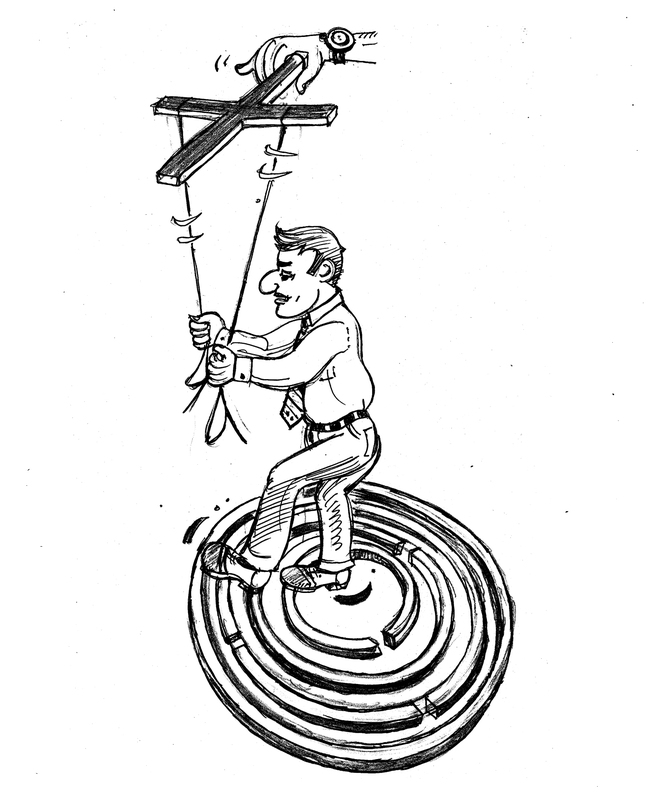 But an underground cable connection shall always exist, selfless friendship sublime. Our depth of understanding and mutual admiration shall beat any negative trends. The other one shall empathize and understand the compulsions, not to bother. For the delicately nurtured, it is more of a challenge, but surely not beyond their capacity. A 16-point Agenda for the 16th Lok Sabha of India! The heat, the dust and the vitriol thrown up by the campaign for general elections in India has already started fading away from public memory. Media has had a field day, what with rival claims being made by the contestants in the fray. Quite a few voters have been at a receiving end of a different kind; of freebies, money and liquor. In some pockets, sheer muscle power has been on overt display. Some armchair revolutionaries are disappointed; when it comes to real issues, whether in the realm of economy, diplomatic relations or delivery of public services, very little light has been generated in the past few months. The denizens desperately hope to collectively bring in a stable and strong government at the centre. They also realize that it is the right time to set the agenda for the 16th Lok Sabha. 1. Boosting infrastructure across the board, especially in the farm sector. 3. Giving an impetus to manufacturing, especially to check projected imports of IT products and selected white goods in the years to come. 4. Simplifying investment processes with clear goal posts. 5. Boosting revenue and simplifying indirect taxation by introducing GST in a time-bound manner. Bringing in DTC so as to reform direct taxation. 6. Revamping our definition of growth which should include not only economic growth but also social indicators like the Millenium Development Goals. Eventually, like one of our neighbours, a Gross Happiness Index should become the cornerstone of public policies. 7. Upgrading skill development mission and related programs so as to reap the benefits of the demographic dividend. 8. Instituting Power and Coal sector reforms. 9. Redefining basic principles of natural resource allocation. 11. Law and order reforms. 12. Political reforms, especially in the areas of poll funding and decriminalization. 13. Curbing the parallel economy; building sector reforms and rationalization of stamp duties. 14. Implementing women’s reservation in all legislative bodies, public services and institutions. Enabling women’s education, empowerment and safety. 15. Focusing on IT-based enablement of citizens. Building on Aadhar card to improve the delivery of services to citizens. Replacing ‘narrow band’ by broadband. Special focus on the greying population. 16. Restoring the dignity of our legislative bodies. A heartening feature of the 2014 election campaign has been the higher voter turnout. The aggregate turnout so far in the first 7 phases for 438 parliamentary seats has been 66.20%, significantly more than 57.41% figure in 2009 general elections. It appears that the silent majority wants to register its aspirations more effectively. This is a clear indication that our politicos need to sink their differences and work together for improving the quality of life of all its citizens. Concerned citizens eagerly await the future contours of their ‘tryst with destiny’ to emerge on the 16th of May, 2014. 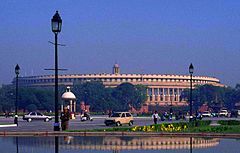 Irrespective of the shape and composition of the new government which takes charge, a vigorous thrust in the areas mentioned above alone can ensure that India performs better and improves upon its image and stature in the comity of nations.